In Washington National Opera’s production of La Clemenza Di Tito, the essence of Wolfgang Amadeus Mozart’s last opera occurs in one of the last scenes. Vitellia, the ambitious daughter of the deposed emperor Vitellius, laments that she sent her admirer Sesto to assassinate the new emperor, Tito, who now seeks her as his queen. The assassination attempt failed and the Senate has ordered that Sesto die. Vitellia realizes that Sesto loves her so much that he has not implicated her in the plot to kill Tito. Feeling tremendously guilty, she decides she must confess to Tito in an attempt to save Sesto. As the title of the opera suggests Tito (Titus) grants clemency not only to Sesto but also to Vitellia. What Director/Set Designer Michael Hampe has achieved in the lamentation scene with Vitellia is considerable. Foremost, his selection of the talented Russian soprano Tatiana Pavlovskaya with her ravishing mane of red hair and simpering mannerisms that change to red-hot emotions in this scene presents as a uniquely perfect casting assignment. What locks in the importance of this scene to the entire opera is the way Hampe and his collaborating set and costume designer German Droghetti have dressed the singer and stage in red fabrics with subtle touches of gold. This includes the singer’s gown, gloves, peau de soie shoes, her fainting couch, and the floor to ceiling draping of curtains that seem to embrace Vitellia as she collapses on her couch. This mise en scene, saturated with red, serves as a set of metaphors that suggests her anger about the throne which she feels is rightfully hers, the fire of love Sesto feels for Vitellia, and, importantly, the actual fire Sesto sets to the Capital building as a diversion to the assassination attempt. Although it is not unusual in Mozart’s operas to find a woman playing a male role, in La Clemenza Di Tito two women play male characters: Sesto and Sesto’s friend Annio. In Mozart’s day, a castrati played Sesto. The role is demanding with vocal gymnastics reminiscent of other Mozart operas such as The Magic Flute. With her rich tones, Russian mezzo-soprano Marina Domashenko was more than equal to the vocal challenge and quite able to affect male comportment. However, a close up view of Domashenko, despite her short hair and male attire, could not mask her feminine beauty. 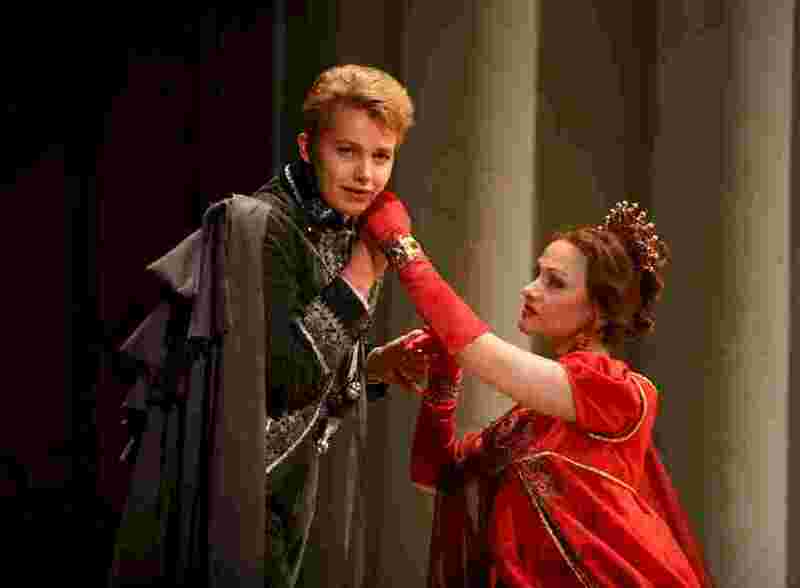 Therefore scenes where Domashenko (Sesto) embraces and kisses Tatiana Pavlovskaya (Vitellia) seem racier than the kissing scenes might have otherwise appeared. On the other hand, Puerto Rican mezzo-soprano Jossie Perez as Annio did not have the same effect. In much the same way as Cherubino (also played by a female singer) in Mozart’s The Marriage of Figaro presents as a boy, Perez portrayed Annio, including his amorous pursuit of Sesto’s sister Servilia. Perhaps because there are only two other male characters—Emperor Tito and his guard Publio—in La Clemenza Di Tito, the casting of women in male roles stands out. This is particularly so because both Tito and Publio are powerful men. In the WNO production German-Canadian tenor Michael Schade holds the title role except for the May 11 presentation when Corey Evan Rotz, with a satisfactory performance, stepped in for the ailing featured singer. The performance by Rotz was most engaging when he as emperor was caught in the absurd dilemmas of forgiving his attackers.Russian bass Nikolai Didenko plays Publio with memorable authority. Generally speaking this two-act opera seria, where an emperor fails to win the hand of the women he taps for marriage, nearly gets assassinated, and still manages to forgive all the transgressors, appears to a 21st century audience as more buffo than seria. In La Clemenza, Mozart’s musical flourishes that ascend in sound coquettishly and echo motifs similarly heard in The Magic Flute also seem to indicate a comic mood.